When I was pregnant with my son, I didn’t have any really weird pregnancy cravings. The only things I really wanted with any sense of urgency were Slurpees from 7-11 and Spree candies. Other than that, I was just basically hungry…a lot. What does any of this have to do with today’s recipe? Well, nothing really. I just felt like sharing. 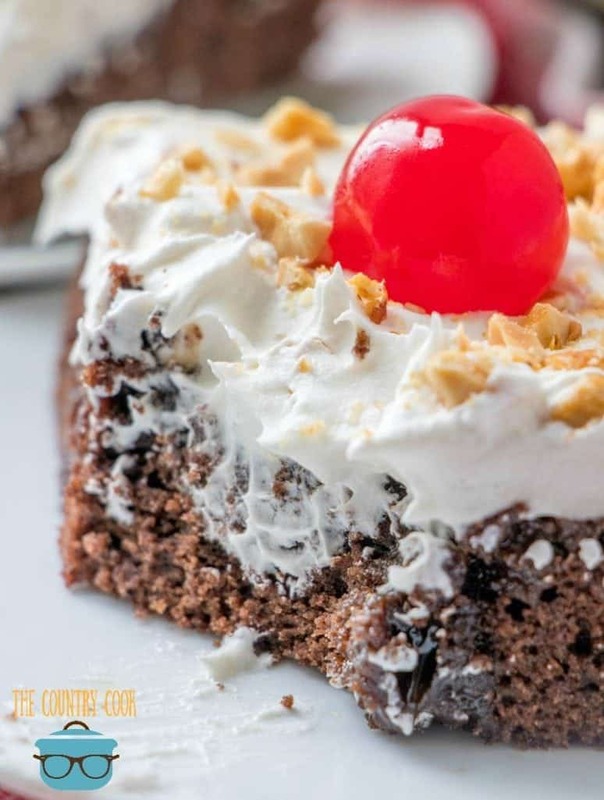 And because this next recipe for Caramel Brownie Cake has chocolate in it. And because chocolate desserts (especially chocolate cake) always got that little baby inside my belly to moving. Preheat oven to 350°F. 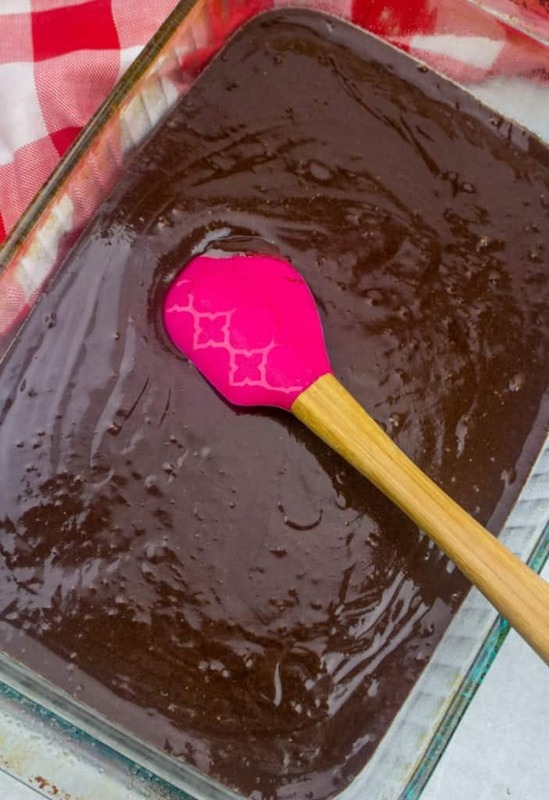 Spray a 9×13-inch baking pan with non-stick cooking spray. Combine brownie mix, water, oil and eggs in large bowl. Basically, you are making the brownies according to the directions on the back of the box for cake-like brownies. 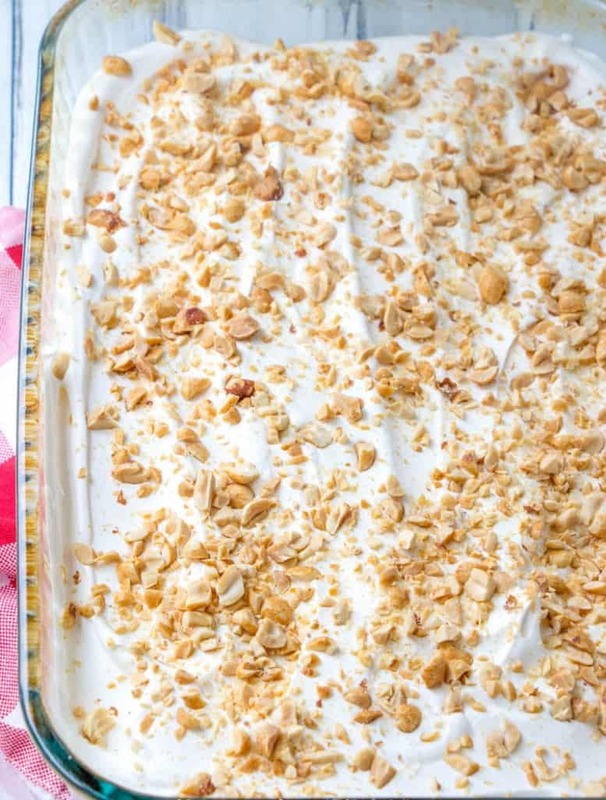 Spread batter into baking dish. Bake 28 to 30 minutes. When brownie cake comes out of the oven (while still warm), poke holes, about 2-inches apart, in warm brownie with the handle of a wooden spoon. Set aside 1/4 cup of the caramel topping. Pour the rest of the caramel topping over the warm cake. Making sure to get it into the holes as best you can. Use a spoon if you need help spreading it out. 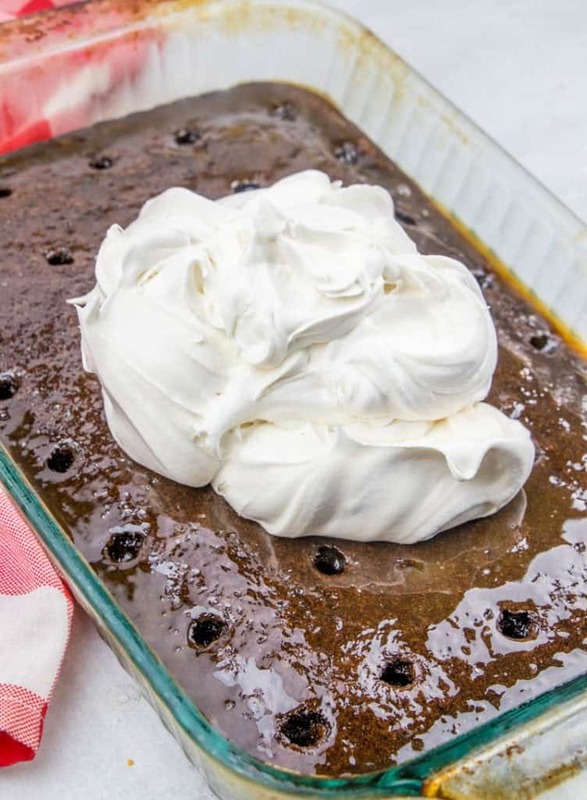 Pop brownie cake into the fridge and allow it to finish cooling completely. When ready add 1/4 cup reserved caramel topping into whipped topping. Stir well. Put all of caramel whipped topping onto the brownie cake. Spread evenly. Sprinkle with chopped peanuts. 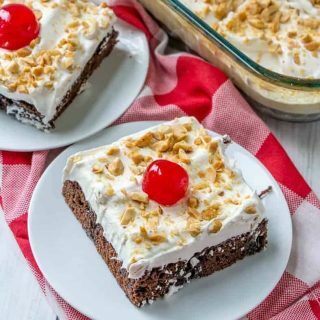 Top each piece with a maraschino cherry just before serving. 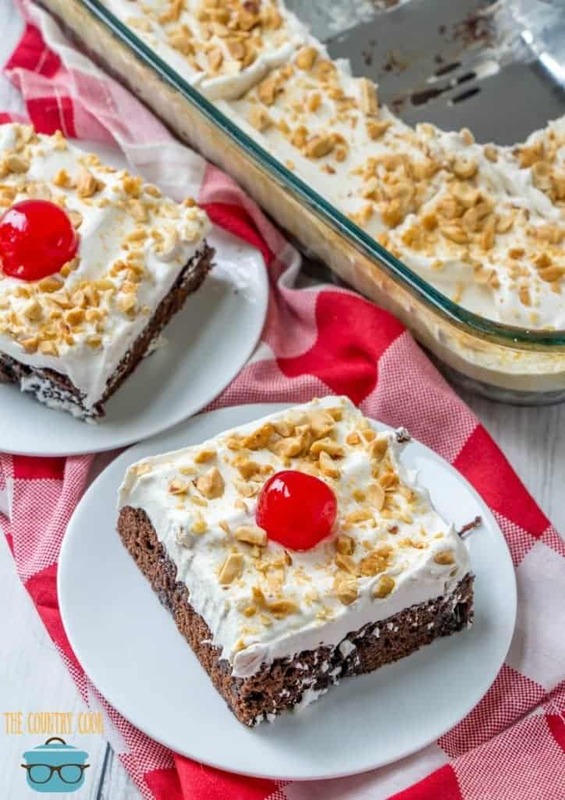 This easy Caramel Brownie Cake recipe starts off with a boxed brownie mix and poked with delicious caramel sauce and topped with whipped topping. Spray a 9 x 13-inch baking pan with non-stick cooking spray. 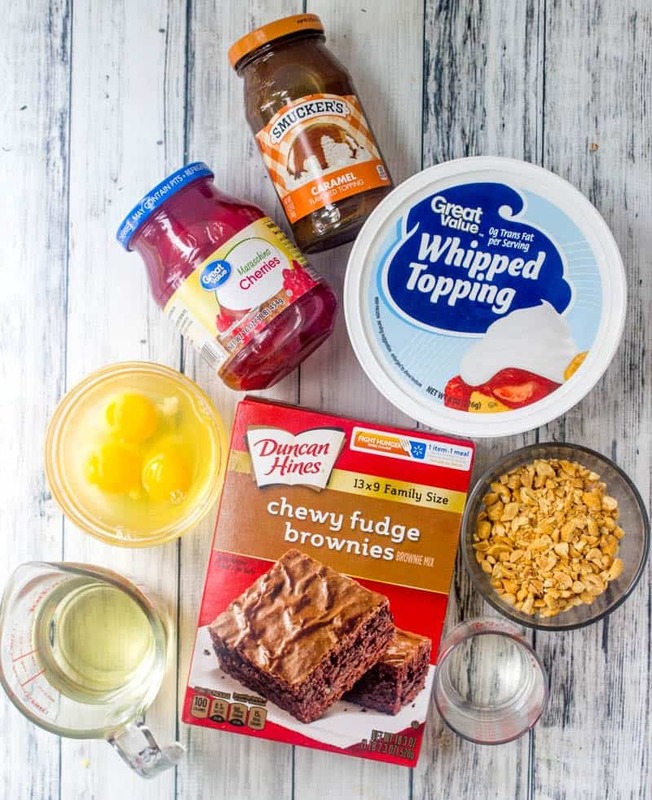 Combine brownie mix, water, oil and eggs in large bowl. (Basically, you are making the brownies according to the directions on the back of the box for cake-like brownies). Spread batter into baking dish. Bake 28 to 30 minutes. When brownie cake comes out of the oven (while still warm), poke holes, about 2-inches apart, in warm brownie with the handle of a wooden spoon. Set aside 1/4 cup of the caramel topping. Pour the rest of the caramel topping over the warm cake. Making sure to get it into the holes as best you can. Use a spoon if you need help spreading it out. 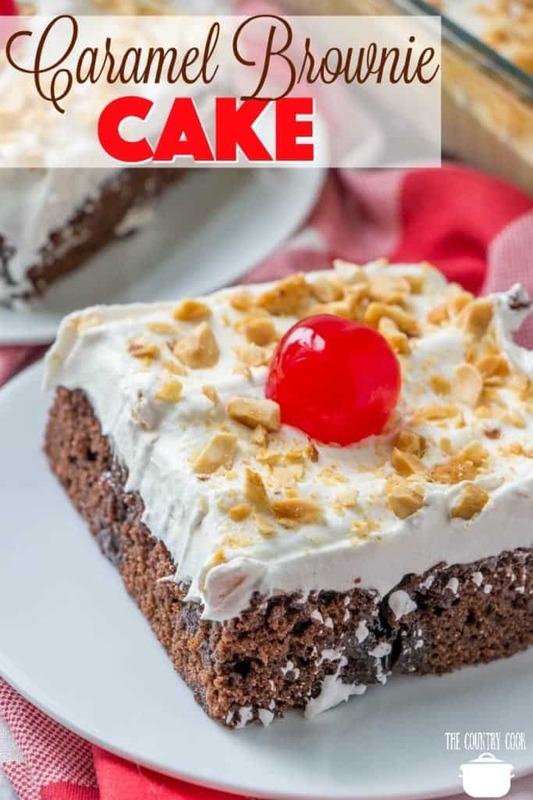 Pop brownie cake into the fridge and allow it to finish cooling completely. When ready add 1/4 cup reserved caramel topping into whipped topping. Put all of caramel whipped topping onto the brownie cake. 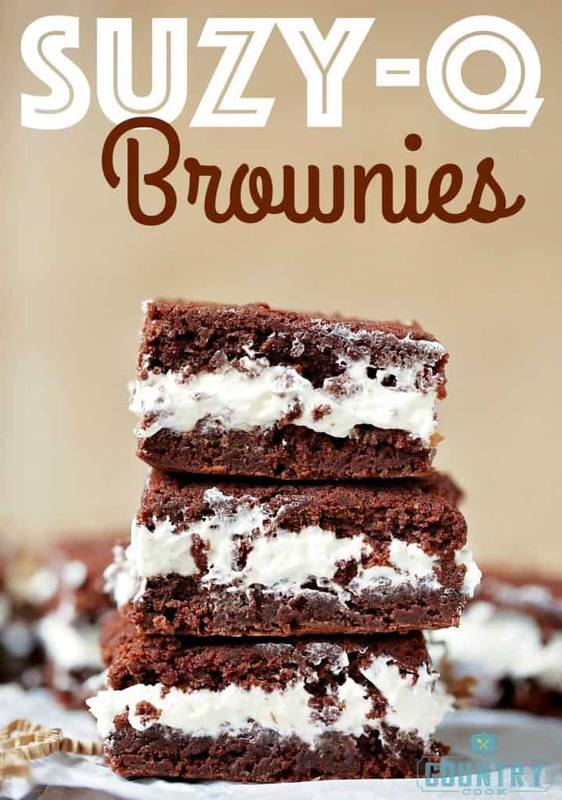 Oh man, I cannot resist a brownie! One of my favs is to have these fav flavors all in one bite (or 10)..YUMMMM! 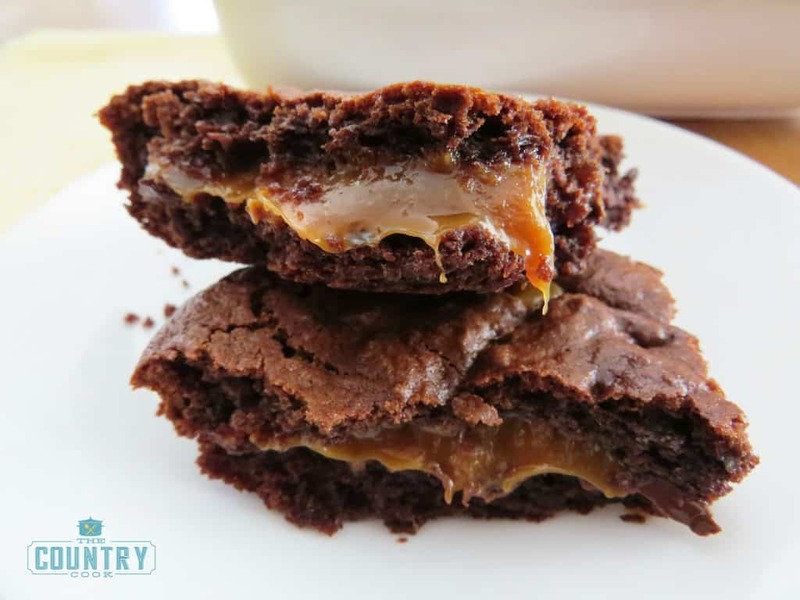 I love how the caramel soaks into the brownie! Perfect! So, so fgood and so easy! WOW. 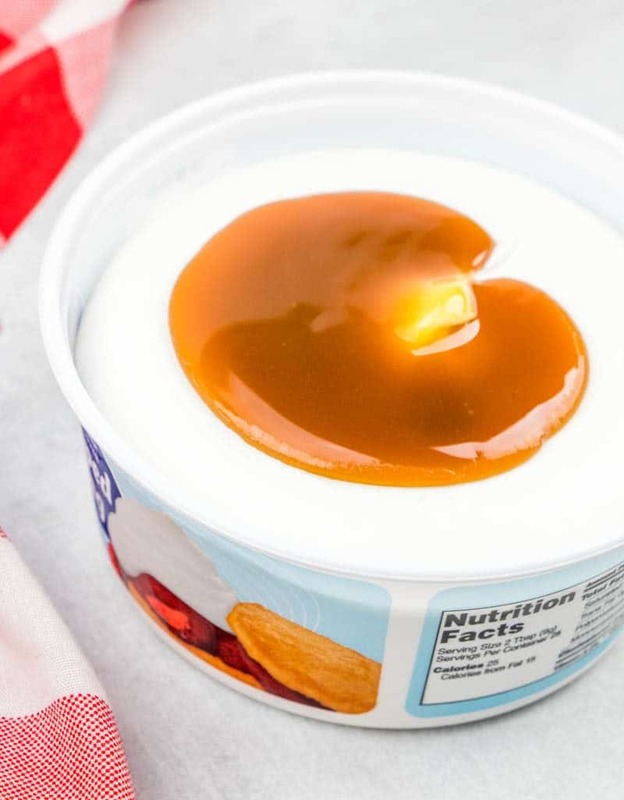 I love that you poked the holes and put the caramel in it. Sounds SOOOO good! These flavors really are just perfect together. I have to echo what Dorothy thought about the holes; perforating the brownie to hold even more caramel is fantastic! 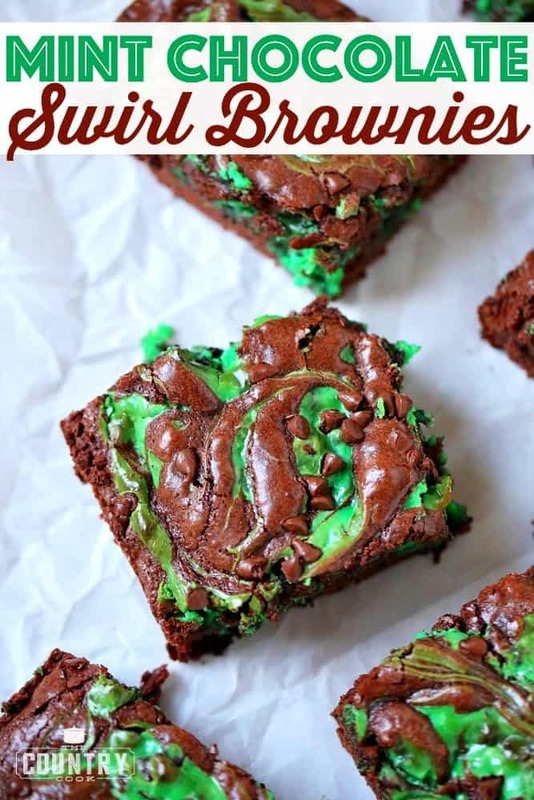 Is there a homemade brownie mix you can use for this recipe? Or, can you use a smaller box of brownies?